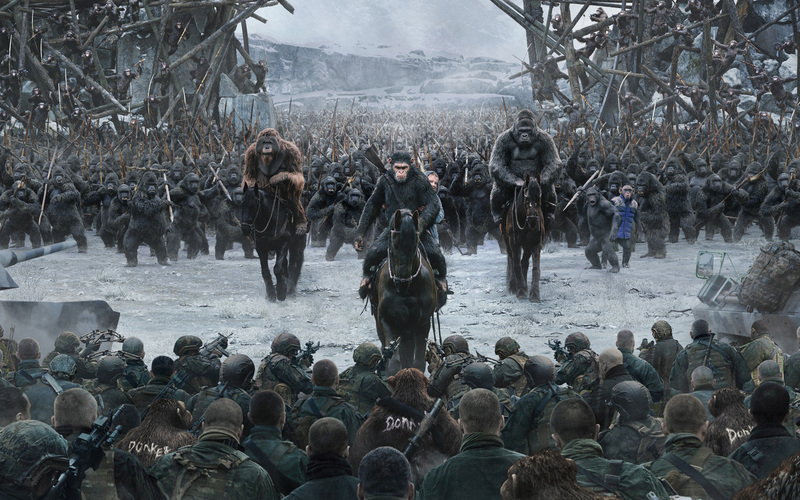 The new Planet of the Apes saga (Rise of the Planet of the Apes, Dawn of the Planet of the Apes and War for the Planet of the Apes) is rich with storytelling excellence and cinematic beauty. Perhaps the greatest question Apes forces us to ask is “Who are we as humans?” Since the outcome of the saga is obvious (the apes take over the planet), the question can then be more focused: “What could bring humanity to its end?” The franchise is thus the storytellers’ interpretation of who we are, what’s wrong with us and whether redemption is possible. The portrait of humanity in the saga is a naturalistic one. The apes’ growth in intelligence is equated with the development of personhood (or even the formation of a soul). This is a presupposition of naturalism, which assumes that who we are as humans is merely based on our ability to operate within higher brain functions than the rest of the animal kingdom. What these films effectively do is illustrate the belief that humans are just intelligent animals because if apes can naturally become humans via intelligence, then there is no basis on which humans can be raised to an intrinsic, image-of-God status. But even with the presence of naturalism, the films grasp, perhaps unintentionally, at genuine transcendence because, with the human race slowly dying off, they create a vacuum for redemption. And this, I believe, is part of what makes Rise, Dawn and War so compelling. The fading of the light has a way of making us heed it, and yearn for it to stay, and so we long for humanity to be redeemed and remade (even if it means incarnating humanity in the apes). As we watch The Planet of the Apes we long for a final redemption because we’re led to believe it won’t come. As glimpses of goodness are sprinkled throughout the films only to be subsequently eclipsed by brutality, we realize what is truly important in life. What we see developing throughout the three films is a prominent Biblical concept: total depravity. Humans created the intelligent apes and fight against the outcome of such a transgression (the virus that kills the majority of humanity), so the remaining survivors unleash their own brutality in desperation, becoming more like animals. Caesar even admits that his own kind is “just like [humans]” in their depravity, implying the infectious nature of sin. The saga provides a parable of what our world is without Christ (animalism). Without a transcendent leader to save humanity from its own destruction, the tribalistic theme presents salvation as only possible in the context of one’s own community (but only if nature doesn’t destroy them first). There is nothing to bring apes and humans together in peace. Strong leaders may maintain a relative amount of peace within one’s own tribe for a time, but nothing good seems to last because evil, from within or without, will eventually bring destruction. There remains a need for an ultimate savior in the Apes franchise. All we find in Caesar is a humanistic hero, one who can supposedly attain transcendent virtues without supernatural help. But the Christian viewer shouldn’t give up hope. As John the Baptist provided the groundwork for Jesus’ ministry (Matt. 3:1-12), so these films can provide the groundwork for the good news by establishing the bad news (the need for repentance; 3:2). Furthering this point, Director Matt Reeves says that Caesar is meant to be seen as a Moses figure. What did Moses do? He pointed to Christ (Deut. 18:15-22). He was the greatest leader for the Jewish people (34:10-12), and like Caesar, he wasn’t perfect (Num. 20:12). The audience is supposed to connect with Caesar because of his humanity (it’s crazy how a computer-generated ape can be so relatable). Yes, naturalism is present with animals becoming humans, but transcendence (albeit its humanistic basis) is also at work in how we see the humanity work itself into Caesar’s emotions and actions. He grapples with the tensions of morality like we do, and so we vicariously participate in his journey. What makes his journey truly captivating is the way he seeks the higher, more vulnerable and sacrificial path. It’s in his character to desire mercy, forgiveness, and goodness. So this begs the question: why do Caesar’s character traits matter to us? Do they serve a purpose that humanism or naturalism can’t provide? What the storytellers are doing is saying, “YES! Caesar is the hero we ought to follow and seek to emulate.” They do this by simply presenting him as the “good guy,” the one we are supposed to root for. Since the worldview of the storytellers determines what sort of character traits are superior and/or virtuous, what can we conclude if Caesar desires, achieves and finds rest in the higher path? 2.) Humans seek transcendence (that they have fallen from). What this saga doesn’t do is provide a way to attain transcendent salvation (but who really expected it to?). It has a humanistic view in how Caesar “pulls himself up to a higher purpose” without the need for God, but that’s no reason to throw it out as anti-God propaganda. Indeed, it shows the need for grace. Perhaps seeing humanity incarnated into Caesar invites us to imagine and hope that we do, in fact, serve a true, transcendent purpose, even when we fall short of perfection. For falling short of perfection, and knowing it, is exactly what the Gospel speaks to (Rom. 3:23-24)! We can relate to Caesar’s inability to be perfect and, hopefully, realize that we are in need of Someone greater than ourselves, and for that reason I have a hard time ignoring the message that Apes has to offer. The overt expressions of Christianity (the “alpha and omega” is also used in one the original films, Beneath the Planet of the Apes, for the name of an atomic bomb) by the Colonel and his army in War may lead some to associate their villainy with Christianity. It is clearly a misuse of genuine Christian imagery. This motif of corrupted religion is so common in movies I can’t imagine the manipulation of Christianity in War to make any impact in the minds of audiences regarding the legitimacy of the worldview. So any Christian imagery the colonel uses must be seen through the lens of this alleged madness. St. Augustine said one “cannot judge a philosophy by its misuse.” To then associate the authentic Christian worldview with the Colonel is to do just that. One may even surmise that the misuse of religion in this film (and the many others) demonstrates a link between madness and religion. That may be true, but the same can be said for any worldview or philosophy. It’s the individual who holds the belief system, not the system itself, that makes one mad.